I am a spiritual son of Padre Pio (not a very good one!). I first read about him when I was a teenager, and through my interest in him, my father later developed a devotion to him which produced the usual signs (perfume etc). When my father died my mother woke up one night almost unable to breathe for the smell of roses. She had been praying to St. Therese for a sign that my dad was in heaven, but when the roses came she said, "I knew it was Padre Pio". Well it is a communion of saints isn't it? 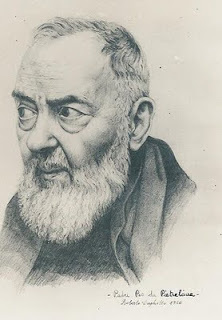 Some people may not be aware of the fact that when Padre Pio first felt the pains of the stigmata, (as a Capuchin priest in his early thirties) he was eventually led to offer his sufferings for priests. He had an interior vision of Christ looking at priests - some of them prelates - and he saw tears on the Lord's face as he turned away saying, "Butchers!". Christ told Padre Pio that he was still suffering, and, to a great extent, this suffering was caused by lukewarm and sinful priests. Padre Pio offered himself as a victim soul. We might remember that in this special year of priesthood when we are being encouraged to pray for priests and when priests are being invited to grow in holiness. It would be a great shame if this year passed by without any real efforts being made by priests and layfolk. This is a time of grace. I'm sure Padre Pio is involved in all this, interceding for the renewal of the Priesthood.